The USS Porter was the lead ship of a new class of Destroyer leaders. Built to counter the heavy destroyers that Japan was then building these destroyers were large. With four twin 5" guns and two quadruple torpedo launchers they packed a powerful offensive punch. As built these ships had rather large forward bridge and aft superstructure and even two tripod masts. As a result they were somewhat top heavy especially when war time modifications added extra anti aircraft guns. This kit represents another new direction for Combrig. Previously concentrating on Russian Navy ships they now have tackled a couple Australian and British subjects and have now stepped in to help fill the void in US Navy Destroyers. 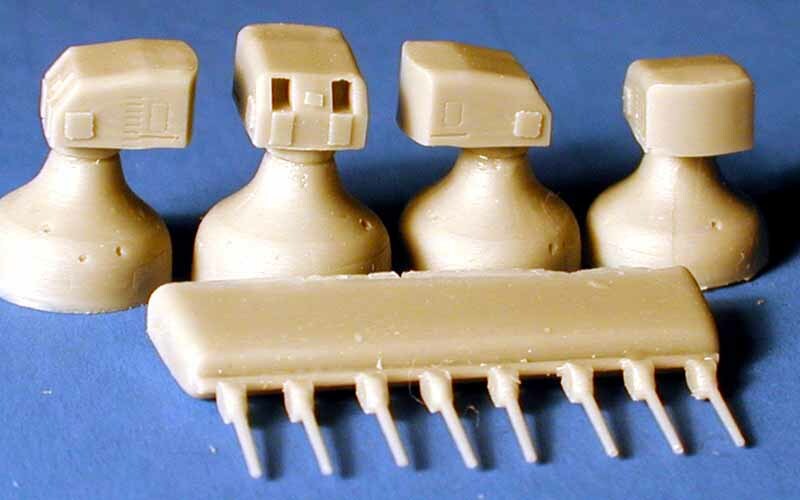 While the Porter Class has been offered by most all of the early resin pioneers, they are all out of production except for the Kobo-Hiryu kit. 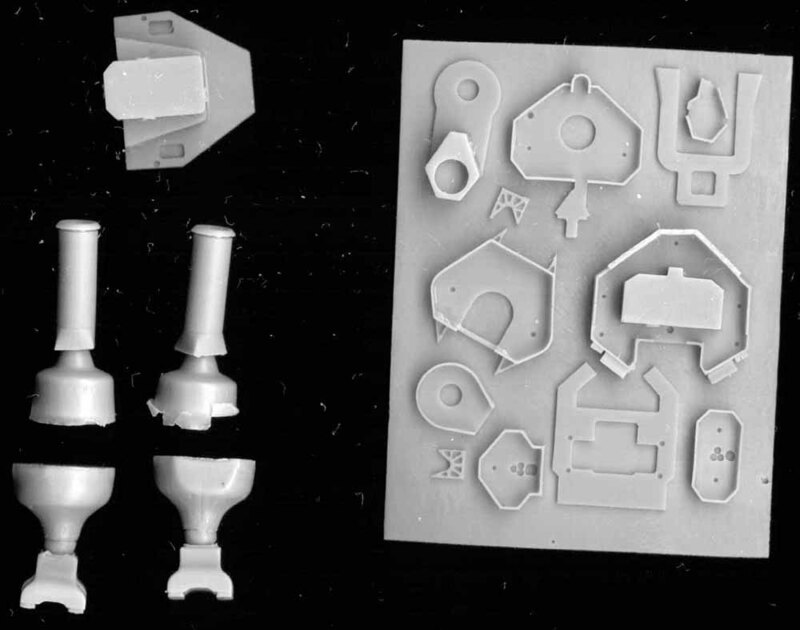 The quality of those kits that can still be found is typical of early resin kits with primitive casting and limited details. 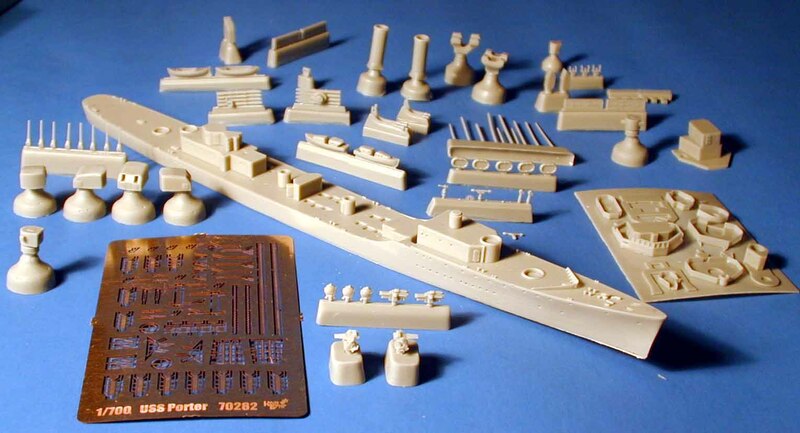 Well we now have another new destroyer kit available, and in a prewar version that is head and shoulders above all previous examples. 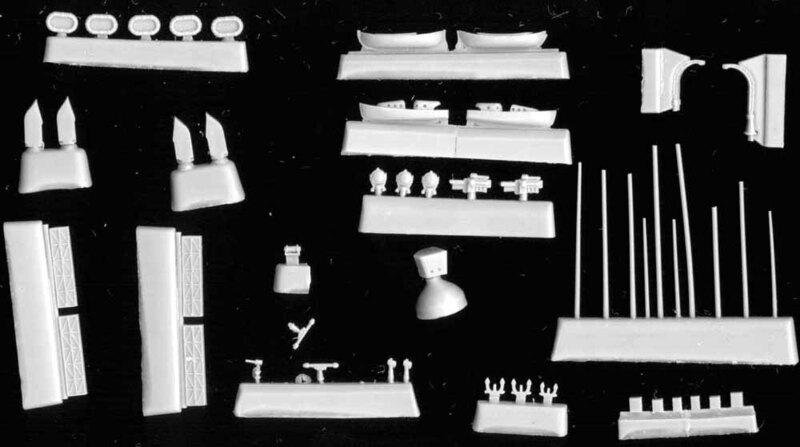 This kit is very similar to the Early War version of the USS Porter so much of this review is identical to that one. There are slots recessed into the deck to fit the ventilators into. 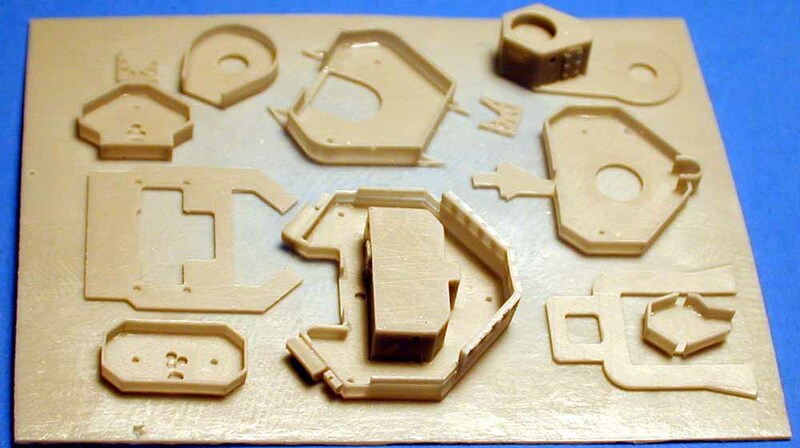 This will help locate those parts and hide the seams when assembled. 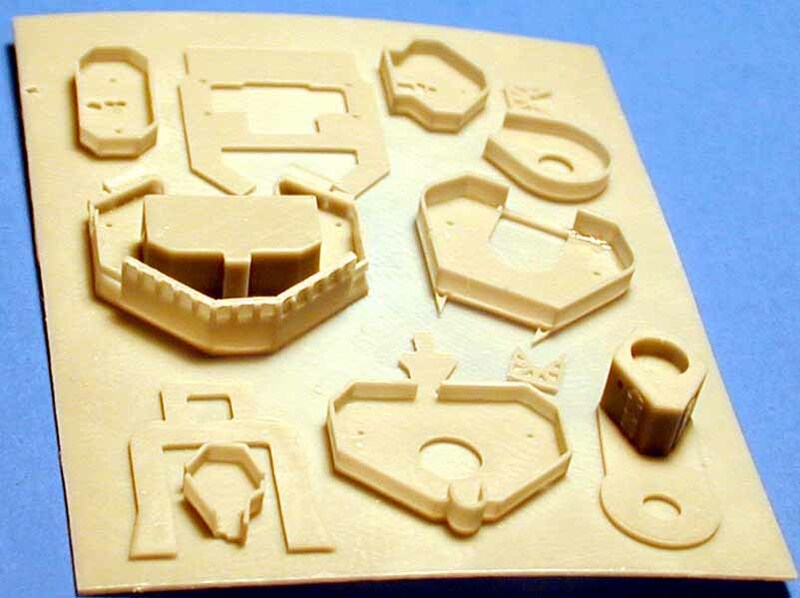 Superstructure parts are cast on a thin resin wafer. The detail of these parts is really amazing with thin walls and splinter shields. I love the way the bridge is cast open so you can add interior details if you wish. If you are careful, you could even open the windows and install glazing! The funnels are cast in two parts, with separate lower trunking. The guns are yet another amazing thing, with nicely detailed 5" gun houses and separate cast gun barrels. But the thing that really blew me away was the 1.1" machine guns. Wow, these are awesome, just clean a tiny bit of flash and install. You get two with this kit, and I'm told these may be part of a future weapons set to be offered later this year. The other parts may be less impressive than the previous one, but are nice just the same. Even 5" loading machines are provided. 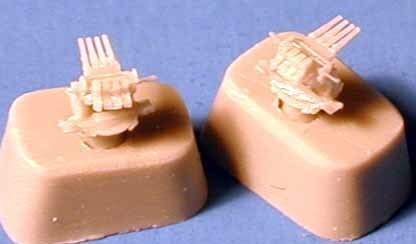 Resin masts are provided but as always I recommend replacing these with stronger brass ones, especially if you plan to add rigging. 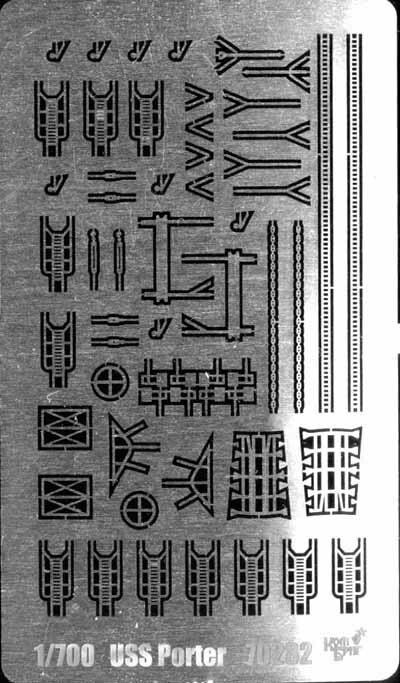 A photo etch fret is included with inclined and vertical ladders, depth charge racks and other items. These are not as fine as some of the other photo etch manufactures are providing. But it is a big bonus to have them in the kit. Instructions were not available at the time this review was written. I will add them when they are ready. This is a terrific new subject with some really great detailing. I am truly pleased to see a new US Navy destroyer on the market, especially one that is done so well. If you don't want to do a prewar version, then don't worry a later version is coming as well. Check the Combrig website for price and availability.